Providing food to low income families and the homeless. Monday through to Saturday Shoreline opens its doors so people can come along and collect food parcels. Each year the Food Bank provides and distributes 1000’s of food parcels to people in need. It started back in July 2011 when a local Southport bakery allowed volunteers to collect produce that was unsold everyday, which the church then parceled up and gave out to those in need. 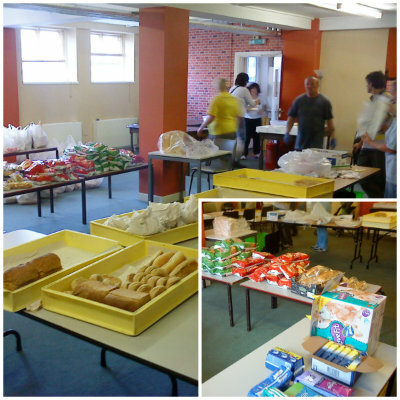 Today those in need can pick up many more items including bread, pies, crisps, sandwiches, vegetables, tinned foods, nappies, and toiletries – supplied by a mixture of local businesses and national companies/charities. This ministry continues to meet people at their point of need. We continue to develop our food programme to be as effective and help those in need in the most efficient way possible. The food bank is open at 5.30pm-6:30pm six days a week, from Monday to Friday and Saturday. Sign-ups are available every day during FoodBank hours. It would be helpful if you can bring a bag to collect your items. If you wish to sign up to the food bank please bring identification, such as proof of benefits, and if claiming food for children please bring a child benefit letter in the name of the child and identification for the child.